Buster Keaton’s Go West doesn’t quite compare to his best films such as The General or Seven Chances, but is an admirable stab at the funny bone nonetheless. In this feature, as usual, he plays the timid wimp, hopelessly inferior to every possible father figure he encounters. Stars today complain about being typecast, but surely silent film audiences had a firmer idea of what they wanted their celebrities to be. Thankfully, the reason that Keaton was a star of the silent screen was because he was able to deliver so consistently using the narrow persona that he fashioned. 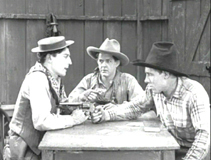 Famously called “Stone Face” due to his lack of facial expressiveness (a trait that actually makes his characters all the more endearing, since they’re so undauntable), the actor sends up that facet of his on-screen personality here in a comical scene in which he’s asked to smile at gunpoint. At that point has to manipulate his face into a slight smirk by using his fingertips. It’s a great joke, but it’s one that is a lot funnier for those who are familiar with Keaton’s other films, and the solemnity that dominates his performances. As such, Go West is probably not the best place in his oeuvre to start. Go West’s plot, like that of most silent comedies, is rather simple, but it allows for numerous opportunities for the audience to snicker at Keaton’s put-on inadequacy. After a hilariously brief, abortive attempt at city life, Keaton (credited here as “Friendless”) heads to the Wild West, and blunders his way into a job as a farmhand. 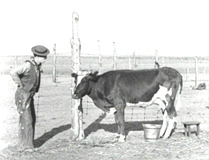 The bulk of the film follows Keaton as he naively goes about performing his tasks as a cowboy. Essentially, the film is most easily understandable to modern audiences as a live-action cartoon, or perhaps more accurately as an antecedent for many of the cartoons that would Keaton’s lead. Even though the it culminates with a wild, 1000-head stampede through the streets of Los Angeles, pathos trumps spectacle in Go West, which gives Keaton a tiny pistol to compete with the other cowboys’ big guns and a wispy physical presence that begs one to scoff. Vaguely asexual, with a charming cow named Brown Eyes as his romantic lead, Keaton’s character is recognizable as a real person, but one that is easy to underestimate. Go West is a large achievement, however, and the small presence at its center tends to ground things. The scope of the comedy, which takes Keaton from coast to coast in search of laughs is undeniably impressive, but there’s something a lot more precious happening when Friendless and Brown Eyes’ eyes connect.